Heck of an idea you've got there, Filmore. 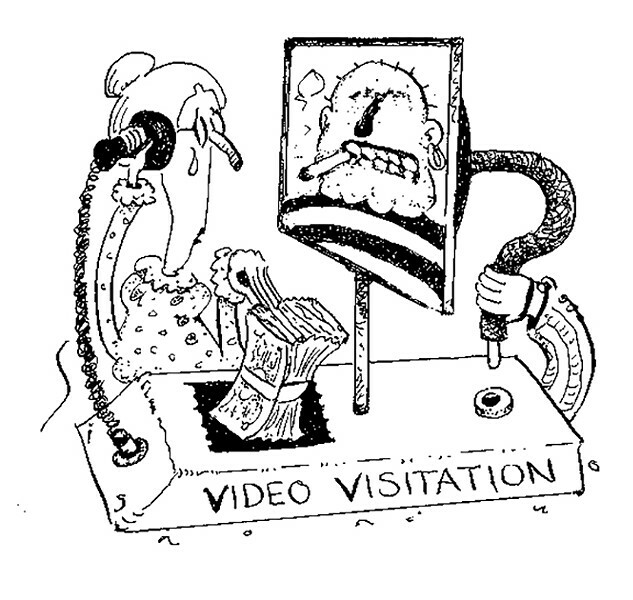 Know who else is a fan of video visitation, as it's called? Good old Joe Arpaio, late of the Maricopa County, Ariz., sheriff's department, where he gained a reputation for ghastly human rights abuses before being voted out of office and convicted of contempt (and subsequently pardoned by Donald Trump). Arpaio called video visitation "a win for everyone involved," and while we live in a complex world with few easy answers, I'd suggest you couldn't find a more reliable rule of thumb than: If Sheriff Joe's for it, be wary. Even if the tech were to get sorted out on the provider's end, consider the customer. PPI cites a Bureau of Justice Statistics survey of previously incarcerated people in which 86 percent of respondents reported an income of less than $25,000—in other words, folks from families unlikely to have access to the decent computers and reliable bandwidth a good video link requires. In-person visits work. Most of these video schemes have been implemented at county jails, rather than prisons, which seems exactly backward: Unlike state prisons, jails aren't the kinds of places that generally require loved ones to travel long distances for a visit. And video visitation isn't supplementing in-person visits, as ideally it should; it's replacing it altogether. In 74 percent of jails, PPI found, in-person visits were no longer permitted after video visits were implemented—in at least some cases, at the request of the contractor responsible for the video technology. It's really expensive. This is the big one, and opens the door to tons of broader issues. Video visitation is administered by external contractors, who charge out the nose for the service—in some cases, up to $1.50 a minute. Again, sometimes these companies will stipulate in their contracts that in-person visits be banned—hey, they're bad for business. This is of a piece with how all sorts of carceral services have been privatized, and at great cost to inmates and their families. It's a tremendous racket: The companies make piles of money, the facilities get a kickback and the fees can be set at extortionate levels while the services provided are lousy—after all, the contractors have a literally captive consumer base and in many cases a near lock on the market. Sending money to an incarcerated pal? That's another way these companies make a buck. The Center for Public Integrity found transmission fees of up to 45 percent in some states; they mention one Tennessee woman who pays a total of $70 just to send $50 to her son in the clink. And remember, that's money inmates' relatives don't typically have; more than a third of families with an incarcerated loved one go into debt paying for visits and phone calls alone. As you might guess, those calls aren't cheap either. In fact, in 2013 the Federal Communications Commission announced rules capping inmate phone fees, citing, for instance, charges up to $17 for a 15-minute call. Who would argue against sensible government regulation like that, right? Well, one commissioner did dissent from the ruling: Ajit Pai, who (you can't make this up) now leads the agency, promoted to the chairman's job by Donald Trump. The companies levying the sky-high fees sued, of course, and earlier this year, with Pai in charge, the FCC ceased its legal defense of the rate caps. In June, an appeals court ruled that the FCC didn't have the authority to regulate inmate phone charges, which could go on being exorbitant. So sure, video conferencing's a great service, just like inmate phone calls—provided you're the one hooking up the cables. Send questions viastraightdope.comor write c/o Chicago Reader,350 N. Orleans, Chicago 60654.